The Yankees set a Citi Field attendance record with a paid crowd of 42,020 on Friday night. According to various reports, there were also some Mets fans in the stands. Saturday afternoon’s game is just about sold out, BUT, there will be a limited number of standing room tickets on sale for the contest (this info is straight from the Mets PR department). Tickets will go on sale on Saturday morning at 9:00 a.m. exclusively at the Citi Field Ticket windows at the Jackie Robinson Rotunda. FYI, game time is 4:10 PM. So if you want to see the Yankees tomorrow and don’t yet have tickets, you still have a shot if you get up early and get out to Flushing by 9 AM. The Mets lost the rubber game and series to their crosstown rival Yankees behind another inconsistent and bad start from “ace” (I used the term loosely) Mike Pelfrey. Through 6 innings Pelfrey looked great and the Mets were winning 3-1, but in the 7th Pelf gave up 4 runs and was promptly taken out. The Yankees went on to score 4 more runs on the Met bullpen making it an 8-run 7th inning and extending the Yankees lead to 9-3. Mike Pelfrey started the game well but all hell broke loose in the 7th and he just fell apart. Over 6+ innings, Pelf gave up 5 earned runs increasing his era to 5.37. Previous to today’s start, all 3 of Mike’s starts in May were quality starts and it looked like maybe he figured the whole pitching thing out but he took a huge step back today. It looks like the mental problems that have plagued him for most of his career are back again. The Mets hit well off of Ivan Nova, collecting 11 hits in his 6 2/3 innings, but the clutch RBI hits were absent again today as they scored only 3 runs. And like the previous game, the Mets left a ton of guys on base (16 to be exact). If you want to win, you simply can’t leave that many guys on base. Justin Turner broke his consecutive games with a RBI streak with an oh-fer (0-4) and he left 5 men on base. The streak was snapped at 7 games in a row. You knew that Turner had to come down to earth eventually but you hoped that when he did, someone else on the team would step up and lead the team to victory with a breakout multiple-RBI game, but that didn’t happen. Pedro Beato gave up his first 2 earned runs of the year in the 8-run 7th inning. By that point, the Mets were already down by 3 runs and the game was basically decided so at least he didn’t give up crucial runs in a close game. Beato’s ERA jumped from 0.00 to 0.95 on the year. Some good things that did happen in this game from the Mets’ perspective were the multiple-hit games of fill-in third baseman Willie Harris and leftfielder Jason Bay. Harris has been in a slump since the first series of the season so it is nice to see him show some promise and the Mets need as many hitters as they possibly can get at this point. Bay hasn’t really hit much since he was signed by the Mets after a monster season with the Boston Red Sox 2 years ago. He still hasn’t produced many runs this year but you have to start somewhere. Rome wasn’t built in a day. The Mets have a day off tomorrow and they head to Chicago on Tuesday to face the Cubs at Wrigley Field at 8:05 pm on SNY. Jonathan Niese will go for the Mets against Ryan Dempster of the Cubs. It’s rare that the Yankees do or say something that makes them appear inept. It’s even rarer when the Yanks do or say something that makes the Mets look smart. But the planets must have aligned with the moons or something this past weekend, because for once, the Yankees looked like fools and the Mets geniuses — perhaps it is a sign of things to come? NOTE: this is an article by Matt Himelfarb, so direct your comments to him. Andy Pettite’s recent retirement has left the Yankees scrambling to fill not one, but two black holes in the back their rotation. As of right now, Freddy Garcia, Bartolo Colon, and Mark Prior appear to be the leading candidates to claim those two spots. Make no mistake, Garcia, Colon, and Prior would make for a fearsome trio in MVP Baseball 2003, but Yankees fans might as well pray Roger Clemens has one more comeback in him (hey, legal fees are expensive). Super LOOGY Pedro Feliciano — aka “Perpetual Pedro”, “Everyday Pedro”, or “Pedro Lite” — has chosen to remain in New York for the 2011 and 2012 seasons. 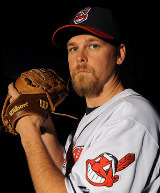 The first-place New York Yankees traded a player to be named later to the Indians for reliever Kerry Wood and cash. The Yanks will pay for only $1.5M of the $3.71 left on Wood’s contract. How do the Yankees keep picking up solid Major Leaguers without (a) giving up much in return and (b) not paying their entire salaries? In other news, the Florida Marlins have acquired LHP Will Ohman for RHP Rick Vanden Hurk. A curious deal, since their trade of Jorge Cantu earlier this week suggested they were “sellers” and not “buyers”. But “sellers” do not make deals for 32-year-old situational lefthanders. I’m not certain, but the Vanden Hurk (Netherlands) – Ohman (Germany) deal may be the first one-for-one, all-European trade in MLB history. Can someone confirm one way or the other? Meanwhile, the Mets are standing pat. They are very confident in their bullpen personnel.